The restaurant business is notoriously volatile. Some combination of the best and luckiest establishments gain a following and stay open. But even so, the restaurant you dine in tonight may not be exactly the same as the one that wowed you six months ago; it’s pretty common for kitchens to launch with one kitchen staff, only to replace this original team, gradually or suddenly, with new members. If the new staff is talented and well trained, the transition should not be noticeable. 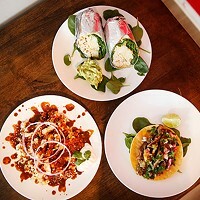 But if they’re not, your subsequent orders from a favorite menu may not live up to the enshrined memory of your first. 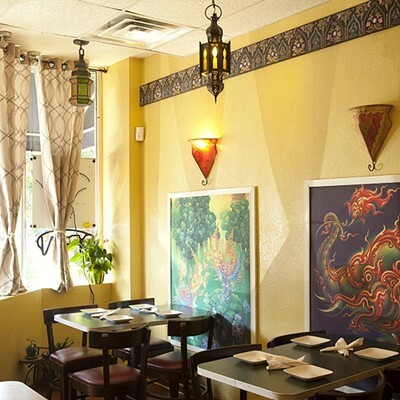 The fruits of this experience aren’t bold new directions in Thai cuisine, but instead a confident grasp of the core Thai restaurant canon, with a few more unique items of interest sprinkled throughout the menu. Currently, Thai Touch is embracing summer with a special emphasis on salads, featuring mango and green papaya, grilled eggplant and, the night we visited, green tea leaf and ginger. We were thrilled to see tea-leaf salad as a special, having just fallen hard for this previously-unknown-to-us dish at another establishment. But ginger is our longtime love, and Thai Touch’s ginger salad actually featured many of our favorite qualities of the tea-leaf salad we remembered so fondly, namely an emphasis on fresh, aromatic herbs over leafy greens and plenty of crunch in the form of toasted nuts, seeds and coconut. 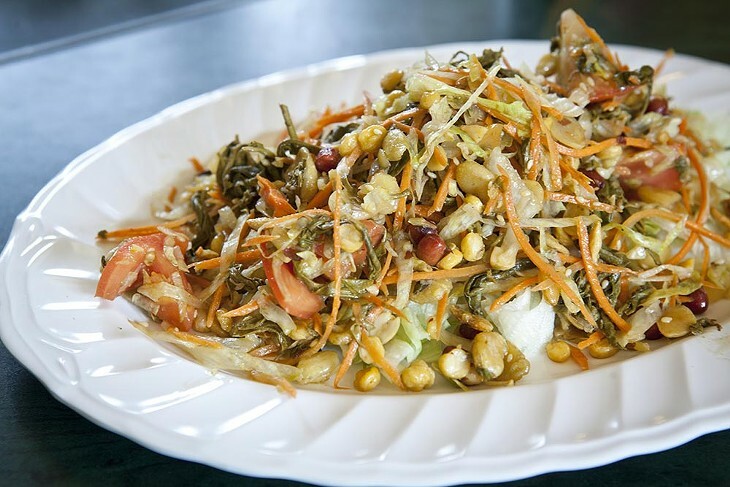 Where a European salad might include a sprinkling of nuts, almost as garnish, this one gained substance and texture by featuring them as a main ingredient, putting us in mind of an Indian chaat, or nacho-like crunchy snack. Ginger flavor was present in the perfect amount: enough to temper the salad’s earthy nuttiness with zing, but not enough to bite. Pad Thai also stood out for its extraordinary texture. The noodles were nicely firm but still shy of al dente; bean sprouts were fresh and crunchy; vegetables were tender; and chicken was moist and supple. In flavor, the sauce skewed slightly sweet, but not enough to fatally tip this dish’s critical balance among sweet, salty and sour notes. Another Thai standard, satay chicken, was 75 percent good. That is, three of four skewers, made with broad slices of white meat, were juicy with a nice hint of grill smoke, but one was dried out. Fried tofu had a golden crust that was almost like breadcrumbs, but the tofu itself was bland and watery, even by tofu standards. A strong sauce might have helped, but the sweet-and-sour sauce that came with it was too weak to rescue this dish. Angelique found weakness in her Penang curry, as well. Its color was a wan yellow-orange where we usually expect a deep, robust red. Its flavor seemed washed-out too, despite being ordered at a four on the 1-10 spice scale, which usually suffices for noticeable, but not punishing, heat. 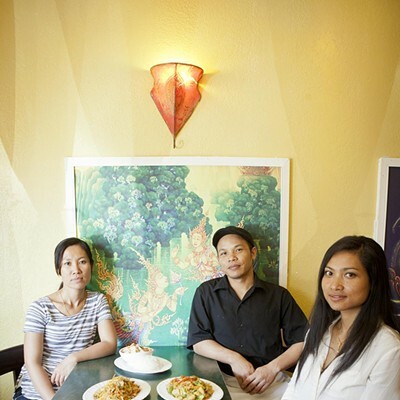 Next time we’ll venture out on a limb and sample one of Thai Touch’s more unusual curries, like banana blossom or mango. Spicy green beans were more to both of our liking. Plenty of crunchy stir-fried beans were still vibrant in color, and sliced pork was flavorful enough to make its presence known. Jason wished there had been fewer batons of carrots — their strong flavor competed for center stage — but the chili sauce was suitably spicy and plentiful keffir lime leaves lent this simple but satisfying stir-fry a distinctively Thai flavor profile. 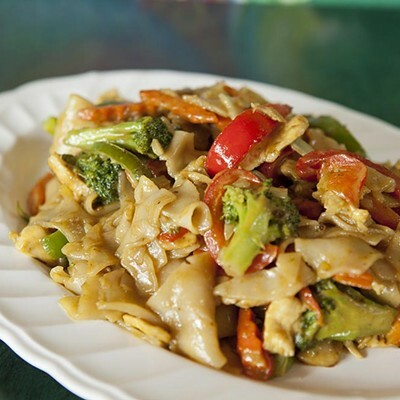 The menu at Thai Touch Kitchen is rounded out with Chinese-American favorites like crab Rangoon and sweet-and-sour stir fry, and the food is served with genuine hospitality. 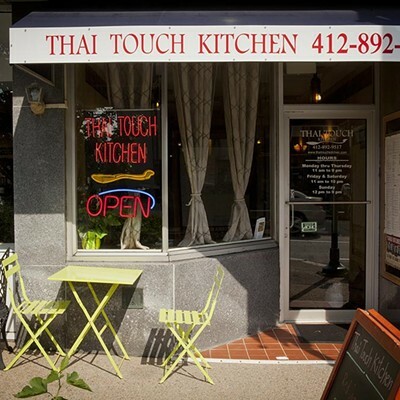 Thai Touch Kitchen does not seek to challenge the palates of diners, but rather to welcome those new to the cuisine and befriend those who already enjoy it. 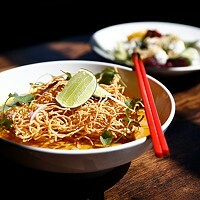 As the menu beckons, “ma long”: Come try.